The primary objective of this project is to demonstrate integrated on-chip thermoelectric energy harvesting using micro-/nano-fabricated Si/SiGe nanostructures with improved efficiencies through the use of bandstructure engineering and phonon bandgaps. High performance thermoelectric materials require high electrical conductivity and low thermal conductivity. Our approach is to engineer thermoelectric materials which enhance the electrical conductivity while simultaneously blocking the tranport of thermal energy through the devices. Bulk 2D Si/SiGe superlattices, laterally patterned 1D nanowires and 0D quantum dots made from Si/SiGe heterostructure technology will be investigated for high performance thermoelectrics in microsystems and other applications. We propose to combine the optimum 2D superlattice or 0D quantum dot material with 1D nanowire patterning to further improve the thermoelectric performance of microgenerators. The final optimised thermoelectric generator will be integrated with a capacitor energy store on a mm-sized single silicon chip to demonstrate a power source for an autonomous system. This will be used to power a micropower CMOS sensor to demonstrate its use as an energy harvesting system. The developed technology will be compatible with the power supply requirements for wireless autonomous systems such as those defined in the IEEE 802.15.4 standard. While the project is aimed at on-chip sustainable energy generation, the techniques, technology and IP being developed will also be able to be deployed into high efficiency (>20%) thermoelectric generators and Peltier coolers for domestic and industrial applications. 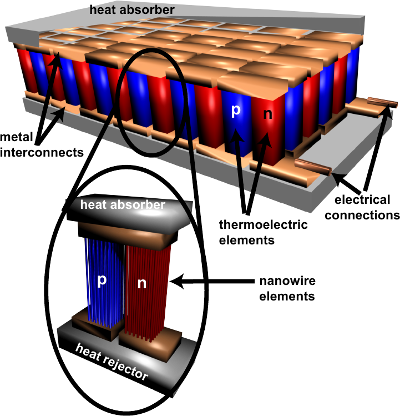 A schematic diagram showing a thermoelectric generator and the insert shows a magnified image of a single thermoelectric module using nanofabricated structures.